China is preparing to launch people to a prototype space station for the first time, and the crew may include the first female Chinese astronaut, or taikonaut. Chinese space agency officials have selected an initial group of potential crew members for the upcoming mission, which will be China's first manned docking. The batch includes female astronauts, according to state news agency Xinhua. 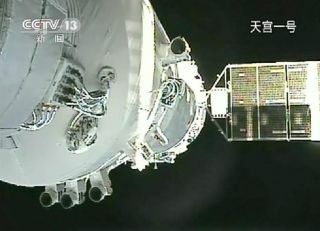 The mission, called Shenzhou 9, is expected to launch between June and August 2012. It will dock with the nation's Tiangong 1 ("Heavenly Palace") space lab module, the prototype for a grand manned space station China plans to establish by 2020. Shenzhou 9's predecessor, Shenzhou 8, was a robotic mission that achieved China's first orbital docking maneuver when it linked up twice with Tiangong 1 in November 2011. "The perfect docking between Shenzhou-8 and Tiangong-1 has laid the perfect foundation for the manned docking this year," Niu Hongguang, deputy commander-in-chief of the country's manned space program and deputy head of the General Armament Department of the Chinese People's Liberation Army, told Xinhua. Niu added that Shenzhou 9's manned docking will feature new technology not used on the previous maneuvers. So far, six taikonauts have launched on three missions to orbit, but all have been male. China put its first human in space with the 2003 launch of its first astronaut, Yang Liwei, on the Shenzhou 5 mission. The finalists for Shenzhou 9 are currently in training, and the three astronauts selected to launch on the mission will not be chosen until closer to liftoff. Tiangong 1 has been operating autonomously in orbit since its launch in September 2011. Shenzhou 9 is planned to lift off atop a Chinese Long March 2F rocket from the Jiuquan Satellite Launch Center in Inner Mongolia.